Available in 2” and 3” inlet head size for various flow rates. min pressure required for flushing 2.5 bar. Filtration grade: 425 – 100 micron, (40 – 140 mesh). 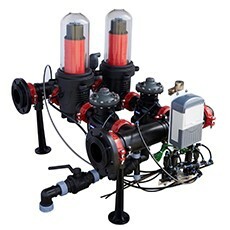 TAVLIT line of automatic disc filters model TAD combines high quality depth filtration with efficient flushing of the disc element. The filter element is composed of highly accurate grooved discs from excellent quality plastic materials. The grooved discs are compressed together to form the filtration element. The intersections between the grooves and the outer surface of the element offer large effective filtration surface with in depth area used to stop debris is especially effective in filtration of organic matter.